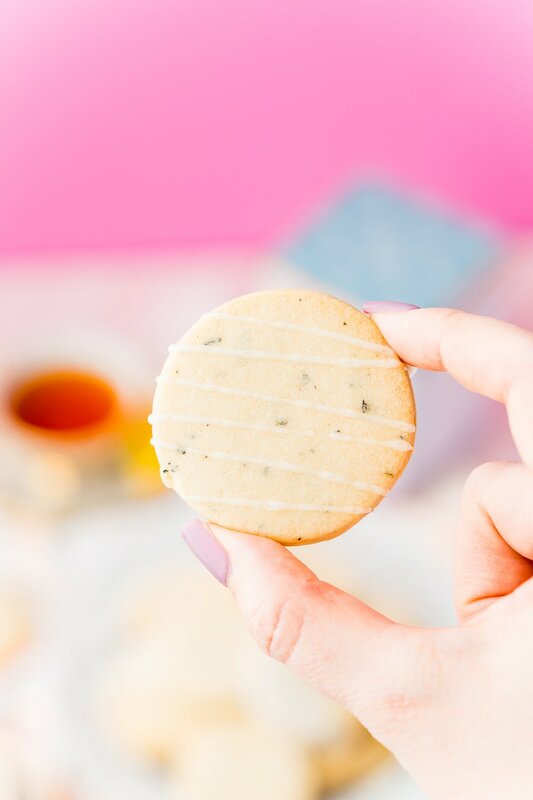 Crisp and buttery Earl Grey Shortbread Cookies with a hint of tea, with just 5-ingredients and an easy lemon glaze, they’re perfect for parties, tea time, or scarfing down all by yourself! 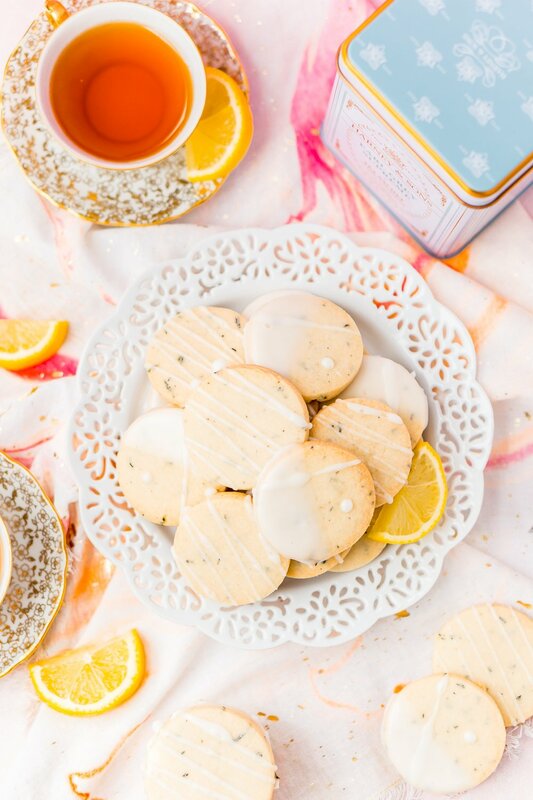 These Earl Grey Cookies are an easy and delightful sweet treat that’s perfect for afternoon tea, cookie swaps, and the cookie jar at home! Shortbread cookies and my favorite! I know, I know… I say every cookie is my favorite… but I REALLY love cookies! Shortbread Cookies have always been a weakness for me. They are just simple and pure deliciousness. They’re just so buttery and addicting! Matt and I will literally kill an entire box of Walker’s or Lorna Doone’s in one sitting, they’re just so addictive. 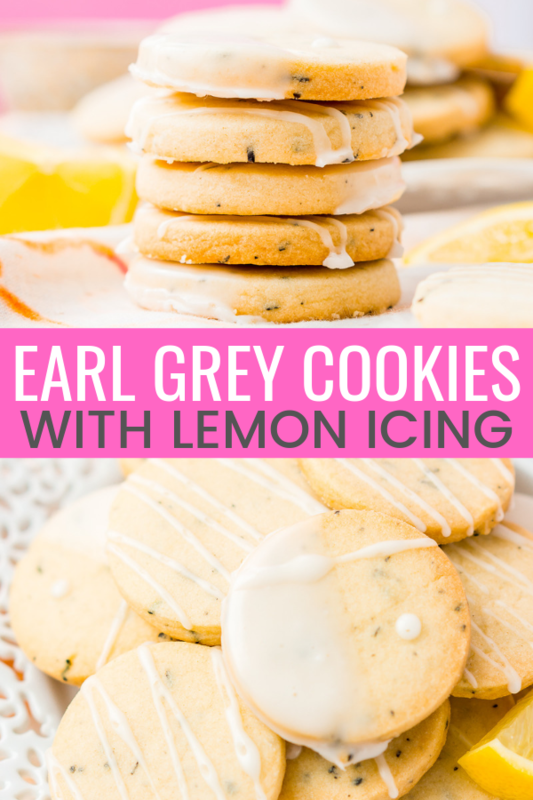 Earl Grey Cookies Are Easy And Cheap To Make! I always thought they’d be difficult to make, but when I stumbled across this three-ingredient recipe from Dine & Dish, I was floored! Just three ingredients and a half hour? That’s easier than a trip to the store and about $3.00 cheaper too! With three ingredients, you’d think maybe they were lacking. 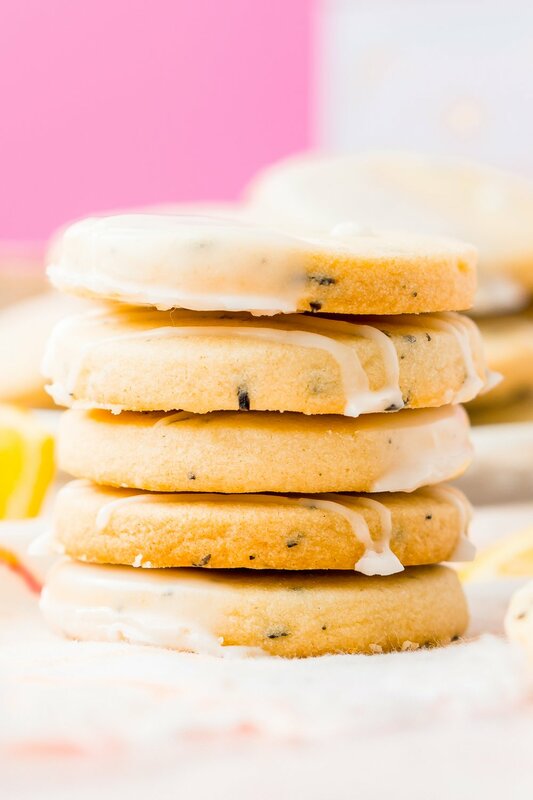 These simple shortbread cookies are everything I dreamed they would be! I decided to adapt the recipe a bit by adding Earl Grey Tea leaves and using unsalted butter and adding my own salt for more control over the flavor. 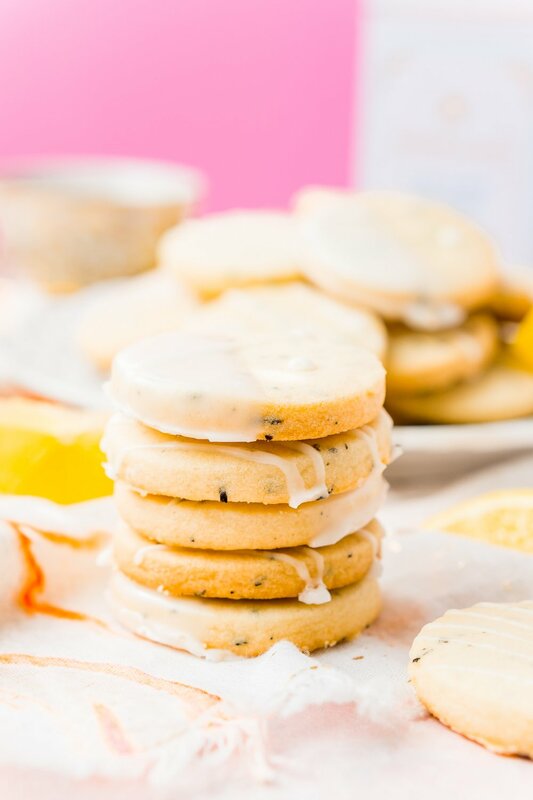 My version is just 5 ingredients (6 if you decide to go with the lemon glaze – highly recommended)! 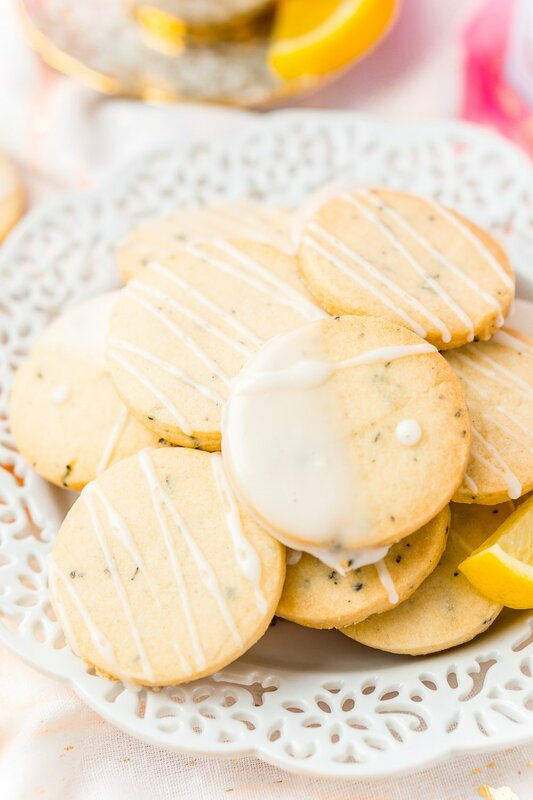 Earl Grey Shortbread Cookies Are Delicious! The end result is perfectly crisp shortbread cookies that are so buttery they almost melt in your mouth. An essence of Earl Grey tea takes them to a whole new level of flavor and fun! They’re so good, I’m not even willing to share, you’ll all just have to make them yourselves! They’re just the thing if you’re looking for a slightly sweet cookie fix! This post was originally published in January 2015 and was updated in March 2019 with new photos. 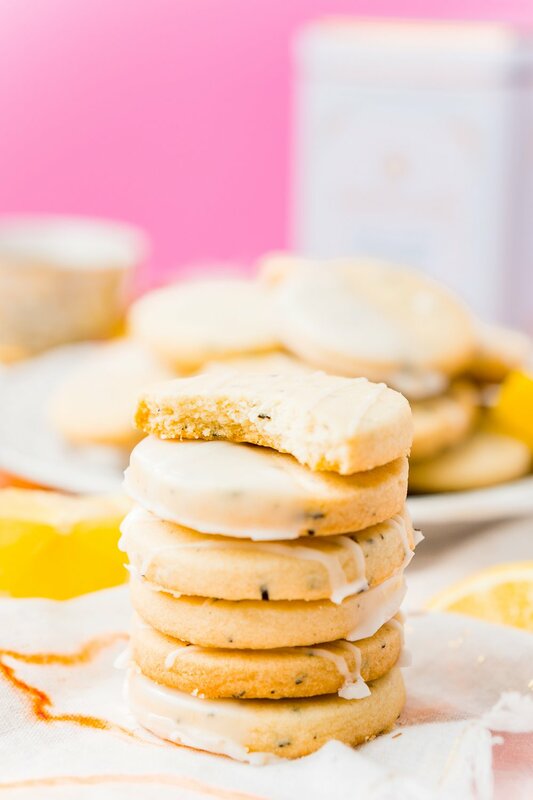 Crisp and buttery shortbread cookies with a hint of Earl Grey, with just 5-ingredients and an easy lemon glaze, they're perfect for parties, tea time, or scarfing down all by yourself! Blend the butter and earl grey tea leaves together and allow to sit at room temperature for at least 2 hours, longer is fine. If you are running short on time, this step can be skipped and the tea can be added with the powdered sugar. Just note that the flavor may not be as strong. Once the butter has finished setting. Preheat oven to 350­° F and line a baking sheet with parchment paper and set aside. Cream the butter and tea mixture and powdered sugar in a large bowl or stand mixer. Add in the flour and salt. continue to mix until a soft dough forms. The mix will be dry and crumbly at first but will come together. Roll dough out on a lightly floured surface until it's 1/4 inch thick. Bake on a parchment lined baking sheet for 12 to 15 minutes or until the edges are golden brown in color. Once cooled, whisk together the glaze ingredients and dip or drizzle the cookies as desired and place on wax paper to set. Slightly Adapted from Dine & Dish. If using a large loose leaf tea, run the tea through a food processor or use a pestle and mortar to ground it so it's finer. 1 cookie is 3 Weight Watchers SmartPoints. The longer these cookies sit, the more intense the flavor will get. I LOVE the flavor of these cookies, they made my apartment smell amazing! My only comment is that I had the crumbly problem that everyone else did. My momma always told me to never overwork something, so instead of mixing until it somehow came together I added just a smidge of water, and that brought the dough together without stiffening the cookie, they were still very “melt in your mouth” by the end. Hi Sheri, I’m glad the water trick worked for you and you enjoyed the cookies. The dough does need to be beaten rather well and long for it to come together, and because there’s no egg or leavening agent in the mix, there’s no need to worry about overworking as long as once it comes together you don’t work it much beyond that point. These didn’t work so well for me… dough was WAY too sticky to roll, so I added flour. Ended up with a mess of cookies, way too browned on the edges and some were blackened messes. This was 10 minutes in. Any advice? Could they have been too thin? Is this normal? Could it be my stove? I’m sorry it didn’t work out for you, Margaret. Did you use margarine instead of butter? The baking could be your oven, they shouldn’t be blackened after 10 minutes, it’s possible they were too thin. Could you please clarify how much 1 cup 2 sticks of butter is? Is it 1 cups plus 2 sticks? I’m from Canada and they are available by cups or mL for butter measurements . Thank you. Thanks for the clarification, Rebecca. I made the cookies and they turned out great! Made these today and they are delish! I loove earl grey and I LOOVE shortbread, so this was a no brainer. I added the contents of 2 tea bags and I kicked them up a notch by making an earl grey glaze! Inspired me to try other flavours, too! 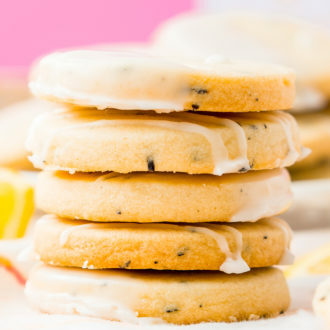 I didn’t have time to search all the comments, so please forgive me if this was already asked, but have you tried adding any lemon zest to these cookies? Anyhow, I made them as written and I am both sorry for my husband and secretly relieved that he doesn’t like Earl Grey! My house smells amazing and the cookies are delicious!! Hi Elisabeth, Myself and others have made them with lemon glaze. add powdered sugar, water, and lemon zest together and dip half of the cookies in and then let them set on wax paper to dry. I am so confused. If I left the cookies in the oven for 20 minutes they’d be toast. Right around 9-10 minutes seems good for mine – I left one batch in for ~13 minutes and they’re too done (but I’ll eat them anyways) – but I did everything else the same! As I sat down to type this, I saw the hubs saunter by and pick one up and put the whole thing in his mouth. He caught me watching him and had that mouth-full-of-guilt look. I’m mostly just sad this means I’ll have to share. Hi Evy, I’m so sorry that you had trouble with the timing, every oven is different, but I’m glad you found a timing that works well for you and I hope you enjoy the cookies! is it 1 cup OR 2 sticks butter? not 1 cup + 2 sticks? Hi Amanda, it’s just 1 cup. 2 sticks of butter equals 1 cup. I have also replaced 1/2 cup of flour with rice flour that gave it a nice crunch. They are lovely with a cup of tea and part of a high tea that I held for a friend. Also I served one of these each beside a dessert that was served in a glass of layered whipped cream with yogurt, lemon curd and raspberries. Very decadent and the biscuit on the side provided a welcoming crunch. I’m so glad you have been enjoying this recipe and finding so many uses for it! Thank you for your sweet comment! I love these cookies! I made them twice this past weekend, once for an event at church and once for home, and here are my experiences: First batch, I mixed with a hand-held electric mixer. The dough was super soft and stuck to my rolling pin like crazy, but still turned out well. Second batch, I used my stand mixer and refrigerated the dough for about 30 minutes before rolling. MUCH better! I used a teaspoon of vanilla bean paste and two tea bags in each batch. I’ll probably omit the vanilla next time to see if I can tell any difference. I’ve already shared your site and the recipe with a few friends who requested the recipe. Love this cookie (or 5!) with a nice cuppa Earl Grey tea while watching, yes, my favorite BBC shows! Thank you for the recipe! I’m so glad you enjoyed them! A stand mixer is definitely the easiest way to mix these cookies! Just made these to quench my current obsession with Earl Grey. I was suprised. This is the first cookie recipe that i didnt have to tweak flour wise. Baked well and tasted amazingly delicious. A new favorite cookie recipe. I’m so glad you loved them and the best part is they only get better with time as the flavor develops! Do you use chilled butter or room temperature butter to cream? Hi Tani, room temp, I just updated it, thanks for asking! Hi Alex, did you line your baking sheet with parchment paper as directed? I want to infuse the butter with the tea leaves for a stronger flavour. But your recipe calls for creaming butter with sugar. So does that mean after infusing butter with tea leaves, I have to somehow remove the leaves or I can leave them with the butter and mix them with the sugar? Hi Erika, the tea leaves are meant to stay in the cookies, you’re simply just mixing the tea leaves and butter together a few hours before you mix the butter and sugar so that the flavor infuses a bit more. I made these awhile back following the recipe exactly (the “short on time” method) and the cookies came together perfectly. I didn’t have lemon juice on hand so I left off the glaze, but they were still so delicious. I’m planning on making a batch with my teacup cookie cutter to bring to Easter tomorrow. Thanks for this recipe! So glad you enjoyed them, they will be a hit for Easter, I’m sure!